Health E-Bytes examine a wide variety of issues in medicine, supplementation and dentistry today. Occasionally, legal issues will be addressed as well. October 19, 2014 | Can natural protocols be an effective treatment for Ebola? December 23, 2014 | Can a dental infection cause a massive heart attack? 09/27/2013 | Dr. Thomas E. Levy's "White Paper" titled Alpha Lipoic Acid discusses the documentation substantiating the fact that Lipoic Acid (LA) has been documented to have positive effects on a wide variety of clinical conditions, which is completely consistent with its antioxidant, selective pro-oxidant, and metal/toxin chelation properties. Any condition with increased oxidative stress can be expected to respond favorably to LA administration. 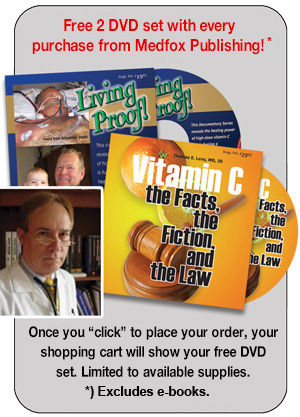 07/23/2018 | Dr. Passwater, Ph.D. Interview titled Are Liposome-encapsulated Vitamin C and/or the Levy Multi-C Protocol more effective than Intravenous Vitamin C?